Mamathira Taverna, Firostefani Santorini. Greek gourmet restaurant. Welcome to mama thira taverna! 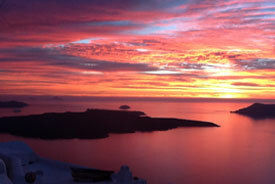 the restaurant with the most spectacular view of Santorini's volcano. The middle level has two areas, one is inside the restaurant and the other one outside.Both relaxing, both nicely decorated and with a view towards Santorini's volcano. One of the things that you will enjoy the most, is the sunset view and its unique colours, that can be seen from every level of our beautiful and amazing restaurant. White and blue colours, wooden and glass materials with spacious tables, impecable service and delicious food with a warm atmosphere, is what mamathira is all about. 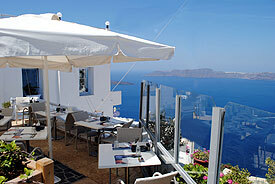 Mamathira restaurant is situated in the famous area of Firostefani, in Santorini island. Carved into the cliffside and overlooking the volcano, thirassia and the fabulous sunset setting makes this restaurant of Santorini one of the hot spots of the island. Mamathira restaurant is well known for its personal care of its guests and attention to every detail.This unique combination of a spectacular view,royal restaurant services and excellent food, renders mamathira one of the most beloved Santorini restaurants. The restaurant offers a terrace, ideal for those of you that need to combine this mythical place with some romance, you can also enjoy your coffee or a bottle of wine with the sunset. The mamathira restaurant has been renovated in 2014. The Mamathira restaurant is devided in two floors. Both of them have a view towards the volcano and the amazing caldera.We have put a lot of thought about our menu and decided to create a unique combination of tastes gathered from different parts of Greece.This way you will be able to try specialties from different locations of our country. Please note that fresh fish is one of our specialties, so ask our stuff for today's special. Mamathira restaurant is build in a traditional settlement just in a few minutes walk from Thira, the capital of Santorini island. With mini markets, traditional gift shops and a bus station just next to the restaurant makes the location of Mama thira ideal and convinient for our guests. The mamathira restaurant is also near the Nomikos conference center so if you are looking for a restaurant near Nomikos conference center Mamathira restaurant is the best solution for you. 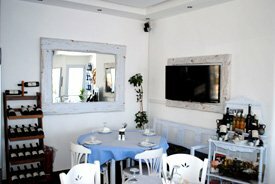 Santorini restaurants, caldera view, caldera restaurant, firostefani restaurantsare some of the keywords you can use to find us on search engines. If you need directions on how to access mamathira restaurant you can download our .pdf file with instructions by clicking here.